Download "Description of AMA Physician Masterfile Data Elements"
1 Description of AMA Physician Masterfile Data Elements Individual AMA Physician Profiles (containing the following primary source reported information from the AMA Physician Masterfile) can be generated for all U.S. Doctors of Medicine (MD) and over 93% Doctors of Osteopathic Medicine (DO). The data elements numbers 1 6 on this list (name, address, etc.) can be supplied by the physician. 1. 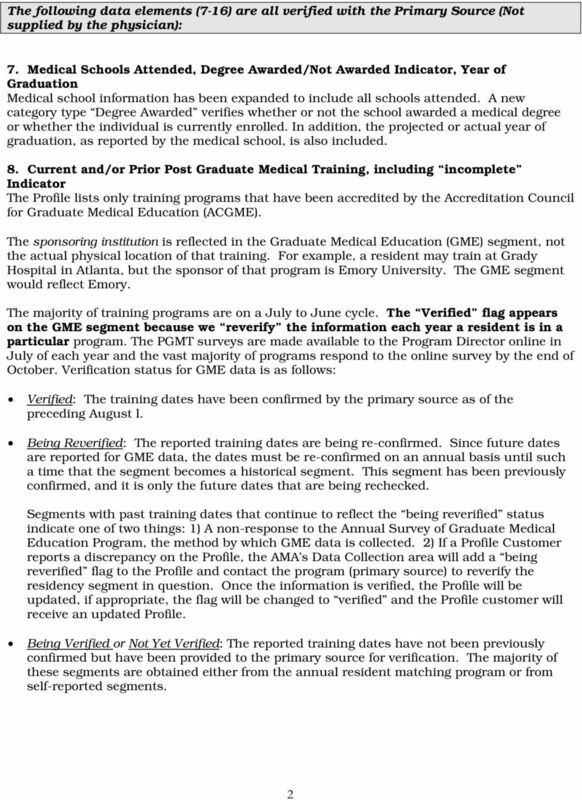 Name At the time that a record is created, the legal name of the physician or student is listed in the AMA Masterfile. Name changes can occur based on data received from data providers and the physician personally. All name changes require legal documentation. 2. 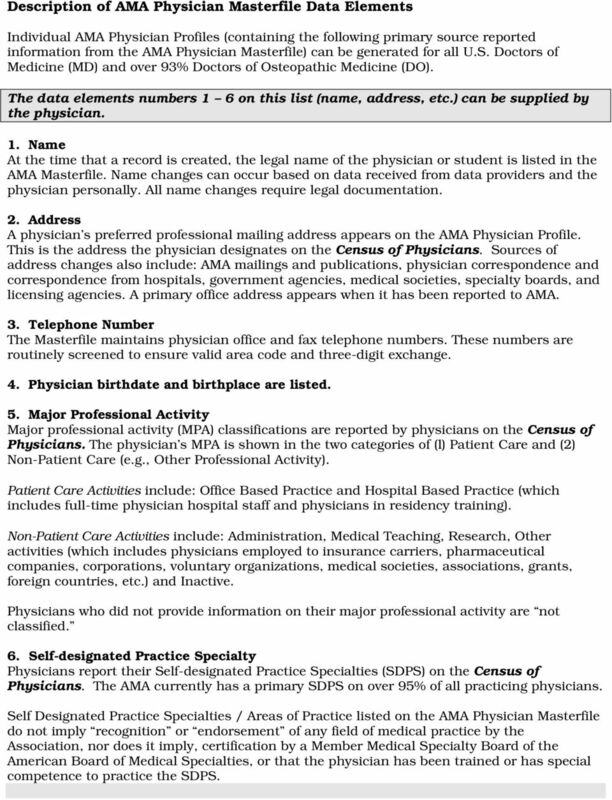 Address A physician s preferred professional mailing address appears on the AMA Physician Profile. This is the address the physician designates on the Census of Physicians. Sources of address changes also include: AMA mailings and publications, physician correspondence and correspondence from hospitals, government agencies, medical societies, specialty boards, and licensing agencies. A primary office address appears when it has been reported to AMA. 3. Telephone Number The Masterfile maintains physician office and fax telephone numbers. These numbers are routinely screened to ensure valid area code and three-digit exchange. 4. Physician birthdate and birthplace are listed. 5. Major Professional Activity Major professional activity (MPA) classifications are reported by physicians on the Census of Physicians. The physician s MPA is shown in the two categories of (l) Patient Care and (2) Non-Patient Care (e.g., Other Professional Activity). Patient Care Activities include: Office Based Practice and Hospital Based Practice (which includes full-time physician hospital staff and physicians in residency training). Non-Patient Care Activities include: Administration, Medical Teaching, Research, Other activities (which includes physicians employed to insurance carriers, pharmaceutical companies, corporations, voluntary organizations, medical societies, associations, grants, foreign countries, etc.) and Inactive. Physicians who did not provide information on their major professional activity are not classified. 6. Self-designated Practice Specialty Physicians report their Self-designated Practice Specialties (SDPS) on the Census of Physicians. The AMA currently has a primary SDPS on over 95% of all practicing physicians. 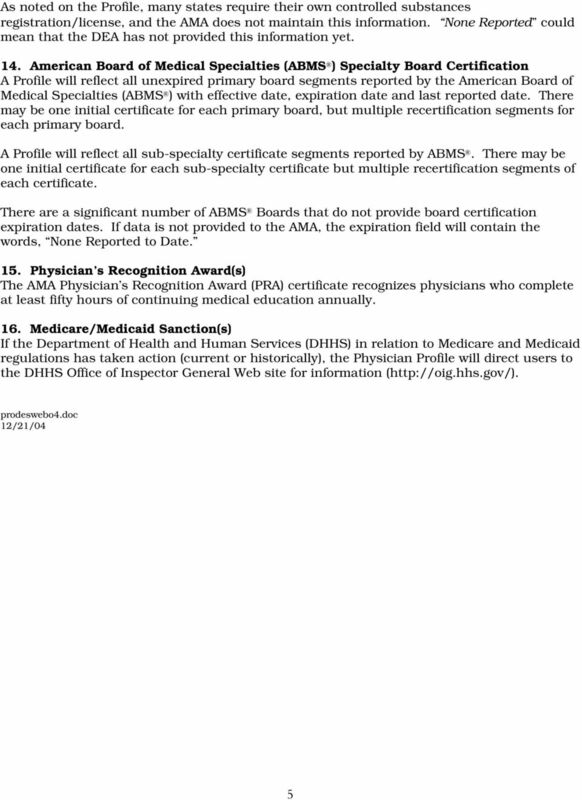 Self Designated Practice Specialties / Areas of Practice listed on the AMA Physician Masterfile do not imply recognition or endorsement of any field of medical practice by the Association, nor does it imply, certification by a Member Medical Specialty Board of the American Board of Medical Specialties, or that the physician has been trained or has special competence to practice the SDPS. 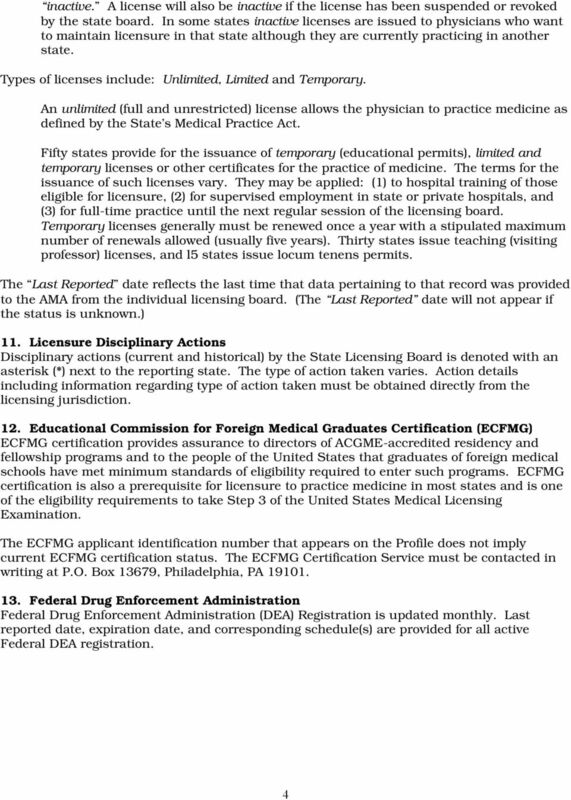 CHAPTER 2 LICENSURE / CERTIFICATION REQUIREMENTS. 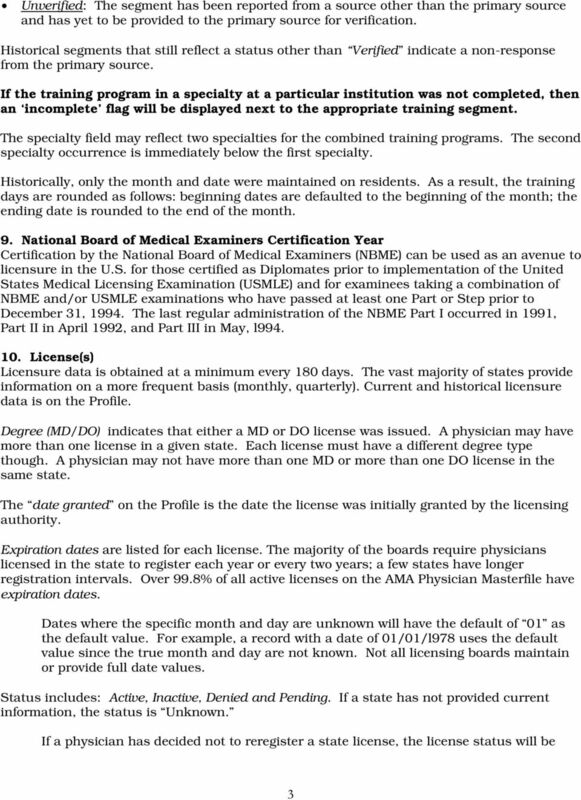 Licensure/Certification by Examination.